Organizers behind the Fight for $15 are demanding SEIU extend its principles of workplace democracy to its own employees. 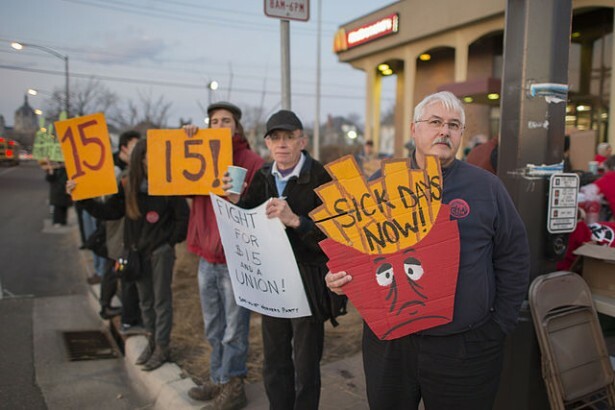 As the Service Employees International Union, or SEIU, held its international convention in Detroit in May, organizers behind the Fight for $15 — the national campaign for a fast food workers’ union and a $15 minimum wage — demanded the union extend its principles of workplace democracy to its own employees. 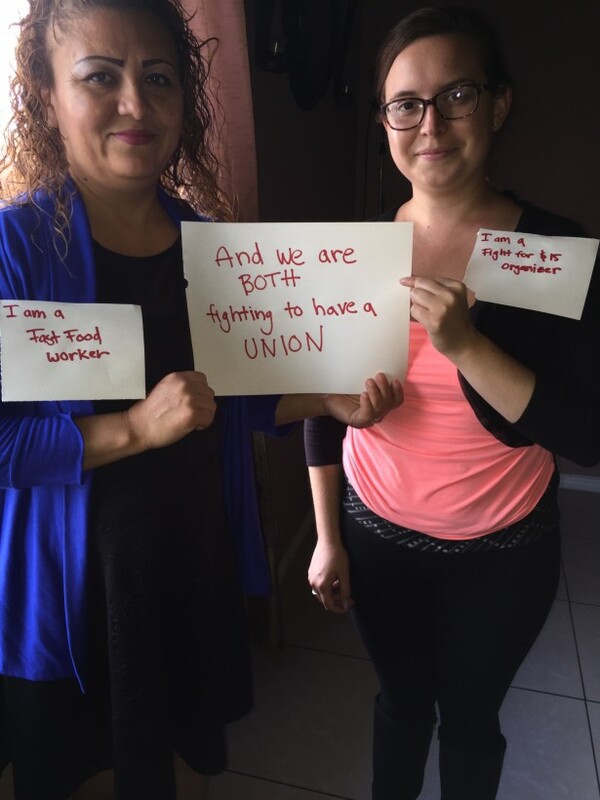 The Union of Union Representatives, or UUR, which represents nearly 100 SEIU organizers, researchers and other staff, went public with the campaign on May 21, in hopes of garnering the attention necessary to win what has turned into an ugly fight. Launching the campaign on social media and in person at Fight for $15 protests held in Chicago outside of the McDonald’s shareholder convention, organizers had a chance to spread the demand to staff not yet involved in the campaign. According to Nicholas Calderon, a UUR vice president and shop steward, 15 organizers with the Fight for $15 campaign submitted UUR membership cards on April 12. Three days later, Christopher Prado, a Las Vegas-based Fight for $15 organizer and one of the original group to file for representation, was fired. “At noon on Tuesday, April 12, I had a meeting with management about my work and our plan for the next 10 weeks,” Prado said over the phone. “At 5 p.m., we submitted our request as Fight for $15 organizers to be absorbed into the UUR contract. And on Friday, April 15, I was retaliated against.” His managers fired him with one week’s severance pay. “The stated reason for his termination was a lack of budget,” said Calderon, but the UUR believes this was a lie, as “the budget was funded for the coming months.” This led the UUR to file an Unfair Labor Practice claim with the National Labor Relations Board against SEIU on the grounds of retaliation for union activity. According to Calderon, these organizers are often on the payroll of SEIU subsidiaries, such as the Western Workers Organizing Committee of Chicago, which — while largely funded by SEIU — are outside organizations. This ambiguity helps SEIU rely on non-union organizers for its grassroots efforts — such as the Fight for $15 campaign — that have gained significant media attention in recent years. It is a particularly contradictory move for the Fight for $15, which has brought lawsuits against McDonald’s based on the argument that a parent company is responsible for labor violations allegedly committed by its franchisees. After voting at their annual conference last year to investigate the status of organizers working for the Fight for $15 and other SEIU campaigns, the UUR found Fight for $15 employees are rightful union members and entitled to UUR representation. This isn’t the first time problems within SEIU have spilled into the public. In 2009, the UUR filed a complaint with the National Labor Relations Board against SEIU in response to announced layoffs of 75 of the union’s 200 members. SEIU isn’t the only union pushing its organizers to the limits. In the face of dwindling resources and a concerted right-wing attack on unions that dates back to Ronald Reagan — continuing under Republican and Democratic administrations alike — unions are fighting an uphill battle. But understanding these constraints is different than condoning the behavior of union leadership. To avoid the errors that plagued the labor movement in the past, greater democracy within unions must be agitated for at every turn. Even on its own terms, SEIU and any other union engaged in similar practices risk more than they gain by denying their grassroots organizers, the heart and soul of union staff, the right to collective bargaining. By retaliating against Prado and those at the forefront of the Fight for $15 for exercising their right to unionize, SEIU’s leadership risks undermining hard-won legitimacy in the eyes of fast food workers and the public and hamstringing their own goals in the process. Organizers are the ones building relationships with low-wage workers in the hope that they’ll vote to join SEIU, which becomes hard to do when SEIU is fighting tooth-and-nail to resist improving working conditions for its own organizers. The Fight for $15 is one of the most important labor struggles of our time, breathing new life into the labor movement with every victory. Many have lauded SEIU for its willingness to devote resources to organizing workers in an industry many unions dismissed altogether. Rather than expending those resources endorsing Democratic Party candidates — especially ones like Hillary Clinton, who have long opposed a $15 minimum wage — SEIU should improve the terms of contract it offers its staff and commit to treating organizers well instead of burning them out. Alex Press is a PhD student in sociology based in Boston. Follow her @alexnpress.